When Steve and Sharan Carew started looking for their third catamaran, they knew exactly what they wanted: something smaller than the Helia 44 catamaran they used to part-own but with almost the same space and luxury – if such a thing could be achieved in a smaller yacht. 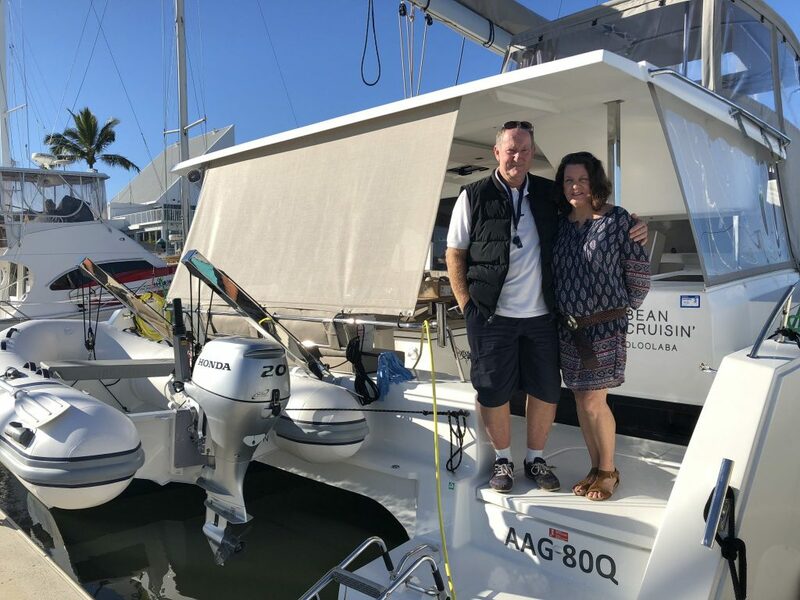 Months on from taking delivery, the couple believe they have come close to finding their perfect match in the form of their new Fountaine Pajot Lucia 40, which they have named Bean Cruisin, after their sons’ chain of espresso bars. “Fantastic!” is Steve’s comment after getting to know the boat. “Every year Fountaine Pajot come out with something new and something even better and this boat is an example of that,” Steve said. 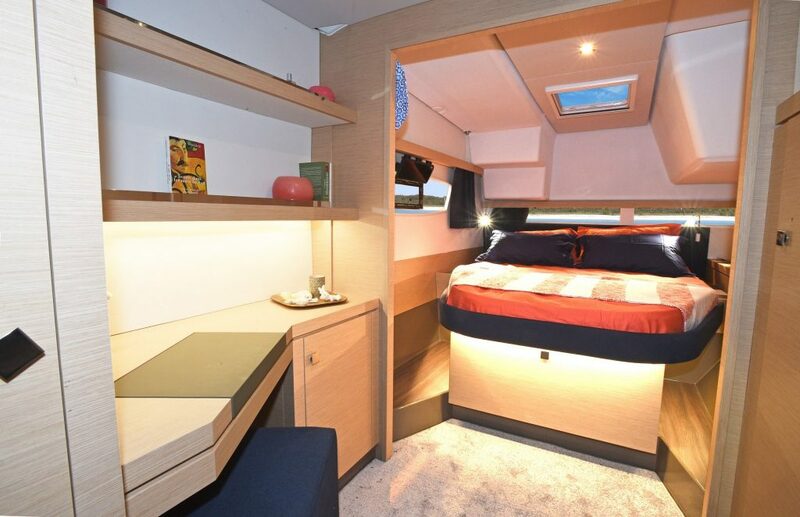 “The Lucia has almost as much space as the Helia 44. In fact, the layout in the Maestro version we bought is amazingly like the Helia given that it is a smaller boat,” Steve said. He said even the cockpit had a similar floor plan and space to the Helia. 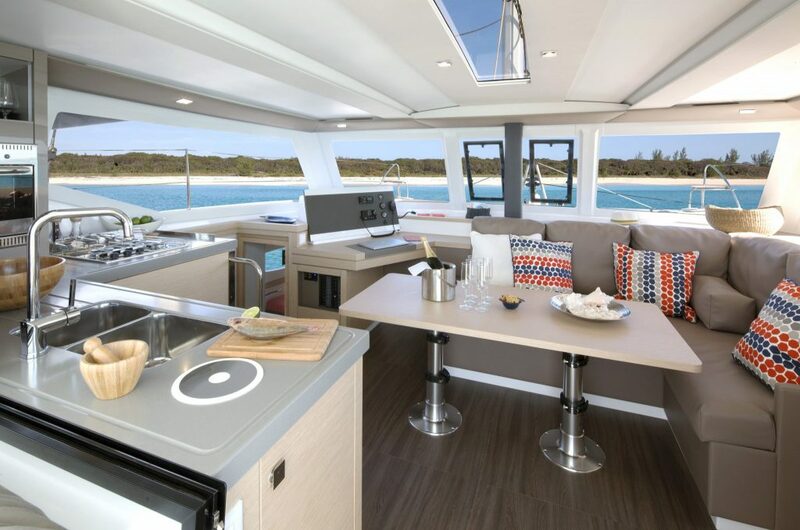 Fountaine-Pajot managed to achieve this by replacing the small forward berths in the previous 41-foot model with stowage lockers, allowing everything to be moved forwards. 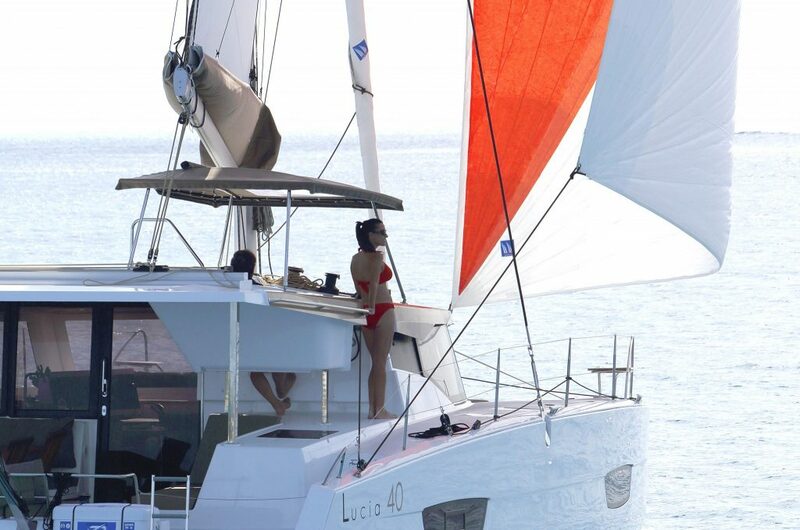 Apart from having tons of space and comfort, the Lucia 40 also ticked all their boxes when it came to their main reasons for selling their share in the Helia 44 and downsizing, which was a boat of their own, tailored for offshore sailing by just a couple. “The Helia 44 was in a syndicate and we wanted to do some more serious sailing on our own boat now that I was semi-retired, including the Vanuatu and New Caledonia rally next year,” Steve explained. Given they planned to do a lot of cruising by themselves, they wanted a slightly smaller boat, even more easily handled by one person because Steve does most of the sailing by himself. “While we were very happy with the Helia, I thought the 40 might be just a little bit easier to handle with its smaller sail area,” Steve said. He and Sharan are both delighted with performance so far after local cruising near their home on Queensland’s Sunshine coast and a Whitsundays delivery and cruise. “I did an eight-day sail to the Whitsundays with the big gennaker up every day. Eight to 12 knots from the south-east, so a beam reach,” Steve said. Steve also found the helm setup even easier for one person, with everything even closer at hand and easier to reach and improved visibility of the port transom when docking courtesy of the innovative and protected “semi fly steering”. He has also fallen in love with furling system they opted for. “The gennaker is on this fantastic little furler, which is a sort of continual furler. It’s brilliant – so easy to use,” Steve said. Another stand-out innovation is the new lounge area with cushions on deck, which is proving to be one of the most popular spots on the boat. Their only hiccup since taking delivery was a manufacturer autopilot issue, which was quickly fixed by Multihull Solutions under warranty. In terms of the extensive offshore cruising they have planned, Steve said a longer waterline length was obviously theoretically better for offshore comfort, but he thought the Lucia would still prove more than adequate. “A friend has a 48-foot catamaran and it will be really interesting to see how they compare offshore when we head overseas next year,” he said. This is the couple’s third Fountaine Pajot; before the Carews bought the part-share in the Helia 44 they owned an ex-charter Venezia 42. In terms of tips for others choosing a catamaran, Steve advised would-be cruisers to opt for the right configuration for what they wanted to do. “Unless you are entertaining large groups of family and friends all the time, I would definitely go for a catamaran with a large owner’s cabin,” he said. “Two bathrooms in the other side is also unnecessary – you are much better off for going for one large bathroom, as we did in our Lucia. After the Whitsundays cruise, Bean Cruisin will be based at Mooloolaba near the Carews’ home until April of next year, when they will head down to the Gold Coast to get ready for the Vanuatu and New Caledonia rally – and making their long-held dream of overseas cruising finally become a reality. The owner’s suite in the Lucia 40 – an island bed is only one stand-out feature.